Michael Schumacher has recovered from the pneumonia he picked up while lying in a coma in a French hospital, a German newspaper has reported. The seven-times Formula One champion had already overcome the pneumonia by the time reports of his condition emerged earlier this week, according to daily tabloid Bild. 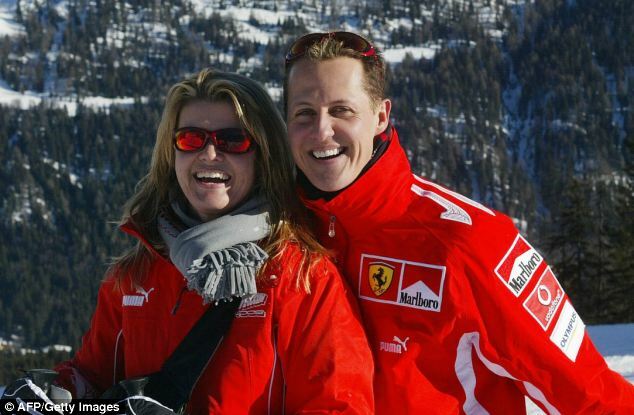 The news comes as Schumacher’s family released a statement saying they ‘strongly believe’ the 45-year-old will recover from the December 29 skiing accident which has left him fighting for his life. In the statement, Schumacher’s family said the most important element of his recovery was not speed, rather that it progresses in a ‘continuous and controlled way’. ‘As often in such situation, no day is like the next. The family is thankful for ones understanding that they would not wish to disclose medical details in order to protect Michael’s privacy. ‘As assured from the beginning we will continue to communicate any decisive new information on Michael’s health state. We are aware that the wake up phase can take a long time. ‘The family continues to strongly believe in Michael’s recovery and place all their trust in the doctors, nurses and nursing auxiliaries team. 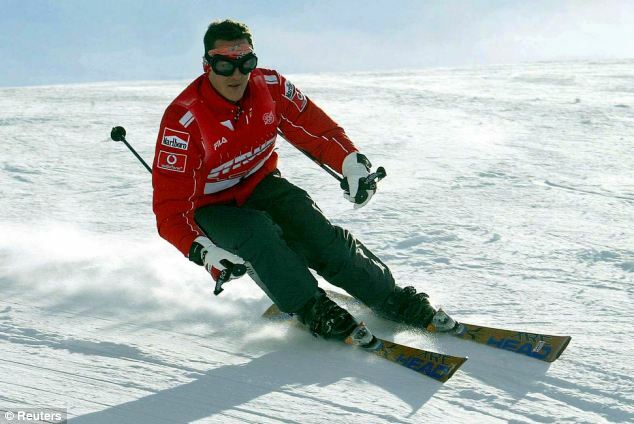 Schumacher’s accident occurred on December 29 in the French ski resort of Meribel, where he owns a chalet. He had been skiing on the piste with his son and family friends but shortly after 11am moved to a patch of rocky off-piste located between two runs. He skied into a rock and then catapulted on to another banging his head with such force that his helmet split in two. He was wearing a helmet camera at the time and the entire accident was recorded. Investigators said it was a freak accident and Schumacher, who is a very competent skier, was not skiing at an excessive speed. 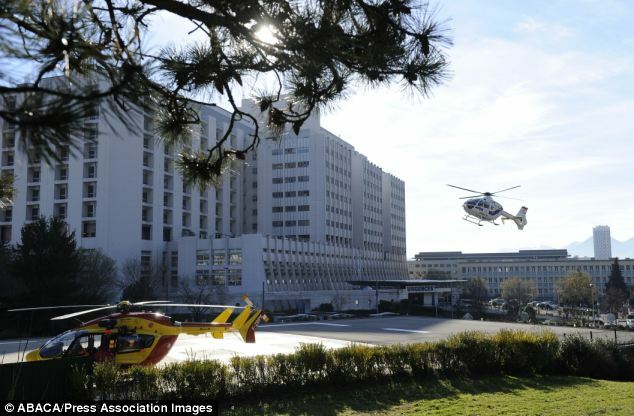 He was airlifted off the mountain and taken to Grenoble University Hospital where doctors put him into a medically-induced coma. A scan revealed he had suffered serious brain damage. His manager released a statement later that night saying the sportsman was fighting for his life. Wife Corinna, 44, with whom the champion has two children Gina Marie, 16, and Mick, 14, has remained at his bedside. His manager this week refused to comment on German media reports that he had contracted a lung infection. Pneumonia is among the greatest life-threatening conditions that can afflict people in Schumacher’s position. The lack of a competent swallowing mechanism can make saliva run into the lungs and trigger the potentially lethal respiratory infection. He receives food through a tube to his stomach, oxygen via a hose from a machine next to his bed as he still cannot breathe independently. Three times daily his joints and muscles are massaged to prevent atrophy and bed sores. The coma suppressed his swallowing reflex, pain perception and his respiratory drive. He has to be acutely monitored around the clock during this wake-up phase to see if such things are returning naturally – if at all. His blood is also thinned to prevent thrombosis and he is regularly turned and even stood straight up at times to keep blood flowing. He lies on a special air-filled mattress to prevent pressure sores and his urinary tract is under constant vigilance because of the danger of waste bacteria entering the bloodstream and causing another potentially fatal infection.